Ginger Zinger Immune Syrup, 4 fl oz each (Nature's Wonderland) - Penn Herb Co. Ltd.
Use the masterful blend at the first signs of immune imbalance and boost your body's defenses with Ginger Zinger Immune Syrup! It is also ideal for those who work with the public and who may face constant exposure. Organic Ginger Root...the spicy root increases circulation, warms the body and supports detoxification. Elderberry...packed with vitamins and immune-supporting flavonoids to help activates healthy immune function. Echinacea...the well-known immune tonic jump-starts your natural defenses, especially during vulnerable periods. 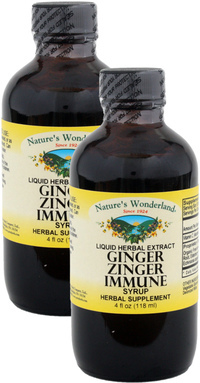 Get the sweet protective support of Ginger Zinger Immune Syrup. AMOUNT PER SERVING (1/2 teaspoon (2.5 ml)): Vitamin C (Ascorbic acid) 60 mg; Proprietary Blend 2.5 ml: Organic Fresh and Dry Ginger Root, Elderberry Fruit, Fresh Echinacea angustifolia Root. OTHER INGREDIENTS: Vegetable Glycerin, Organic Honey. Deionized Water. Free of: milk, dairy, egg, fish, shellfish, tree nuts, peanuts, wheat, gluten or soy. Immediate immune support; seasonal immune tonic; soothes upset stomach, sour stomach, gastrointestinal distress. Take 1/2 teaspoon as needed, or as frequently as desired. Can be diluted in hot water. Shake well before using. 1/2 teaspoon = 478 mg.